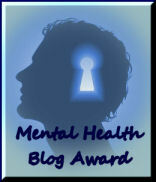 My top nomination for the Mental Health Blogger Award goes to Rocking Complacency. Rocking Complacency is absolutely jam packed full of excellent information for dissociative trauma survivors, with everything from genuine tips on internet safety, how to make excellent therapeutic progress, ways to address internal communication with DID systems, massive amounts of information about removing and undoing mind control / programming, helpful thoughts on recognizing and staying safe from predators, etc. This blog is a MUST READ for anyone interested in Dissociative Identity Disorder, healing, and safety. I simply cannot recommend it highly enough. RC gets full marks, 5 stars, 10/10. There is tons of information, and lots to read, so you are serious about your healing, Rocking Complacency will no doubt be a valuable resource for you. Dig deep, give the words lots of thought, and learn, learn, learn. You’ll progress in your healing if you do, I promise! Thank YOU, Rocking Complacency for sharing such incredible and difficult information. I have not met anyone anywhere who can say these tough things better than you. Well done!! UPDATE: The Rocking Complacency information will be coming to DiscussingDissociation via eBooks. We are working on this, and hope to have them available soon. I wish you the very best in your healing journey…. This is what happened to me…. There is a message there saying they took all the content down. How do we access their information?